General tab contain General, display, group and members discounts configurations. 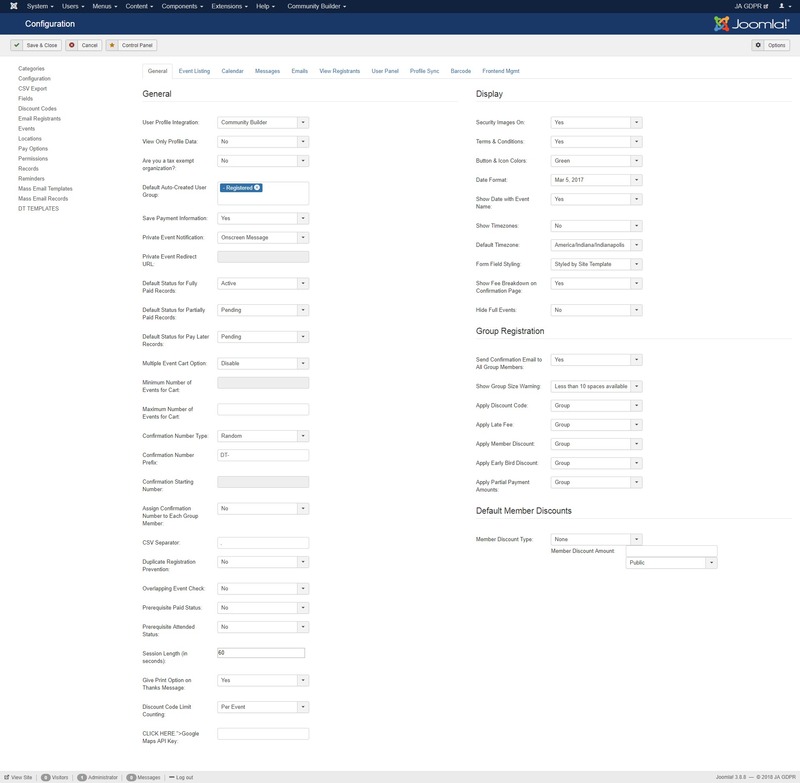 User Profile Integration: Select whether or not to integrate with the Joomla user profile. 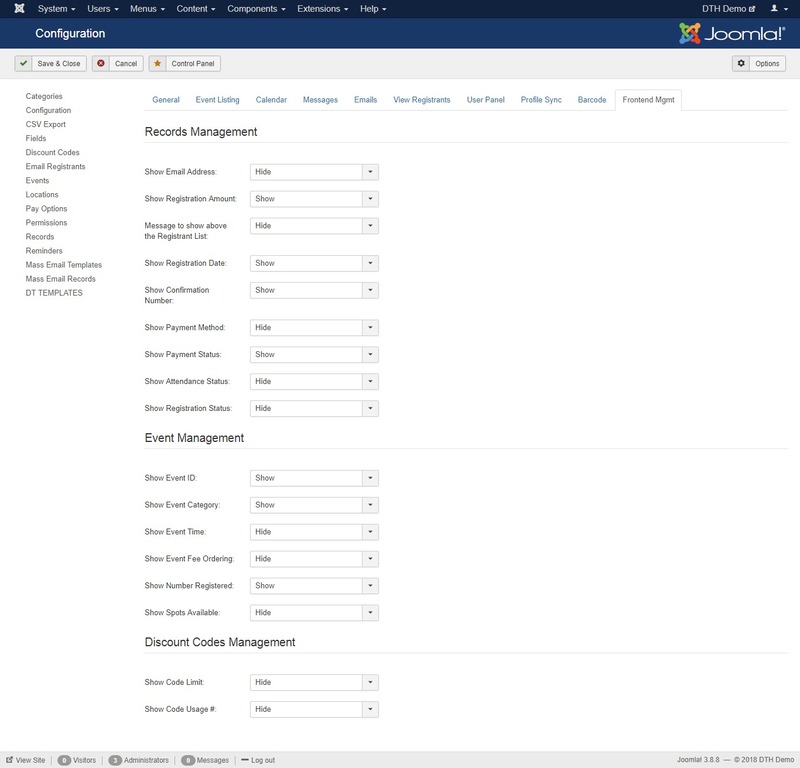 Select No, or you can choose to integrate with either JomSocial or Community Builder. 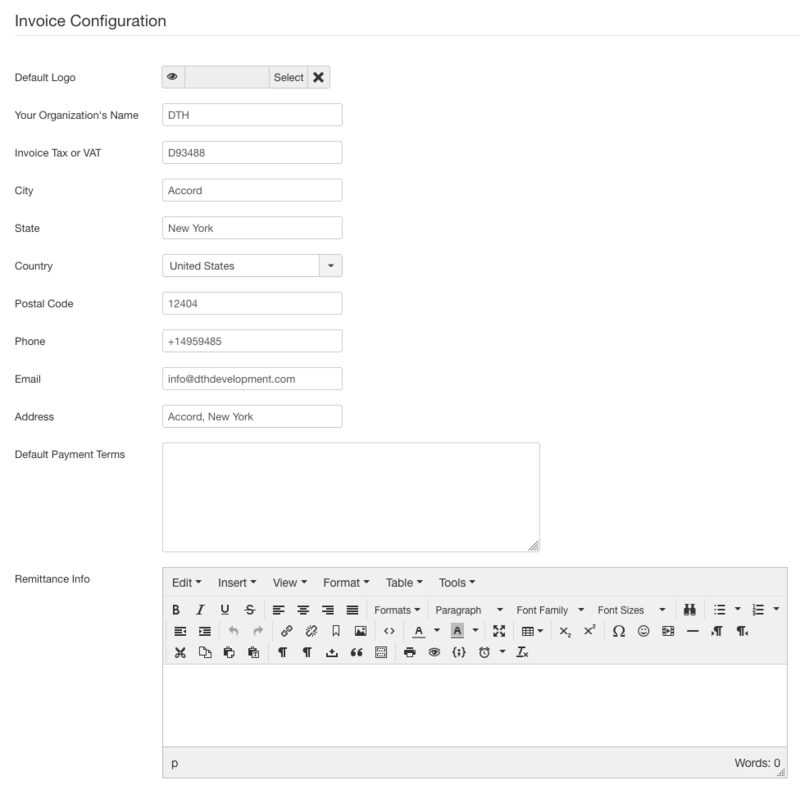 When integration is enabled, the registration form fields will auto-populate with data from the user profile. View Only Profile Data: When using CB or JomSocial Integration, select YES if you want the form fields auto-populated as view only. Then the user will be unable to modify any data coming from the profile. Select NO to populate fields but leave them editable. Are you a tax-exempt organization: Select Y if your organization is exempt from paying taxes for events. If you select Y you will be prompted to enter your tax exemption code. Save Payment Information: Let the user save payment information. Private Event Redirect URL: If you have selected to use private event redirect URL, then this URL is where users will go automatically when trying to access an event or feature that requires user login. You should provide the url to your login page. Be sure to include the http:// at the beginning of the URL. Default Status for Fully Paid Records: Select the default status for new registration records that are fully paid at time of registration. Default Status for Partially Paid Records: Select the default status for new registration records that are partially paid at time of registration. Default Status for Pay Later Records: Select the default status for new registration records that are created using the Pay Later offline payment option. Multiple Event Cart Option: Select to Enable or Disable the Cart which allows you to register for multiple paid events in one transaction. When enabled, the cart view will follow after the confirmation page. Disable the cart to skip that page in registration. Maximum Number of Events for Cart: If using the cart feature, you can enter a number for the maximum number of events to set as allowed in the cart. For example, set a maximum of 3 here and the cart will not allow a user register for additional events once the maximum number is already in the cart. Confirmation Number Prefix: If you enter a prefix here, it will be added to the beginning of the confirmation number that is generated. Confirmation Starting Number: If you choose a sequential confirmation number, please enter the number you want to start with. 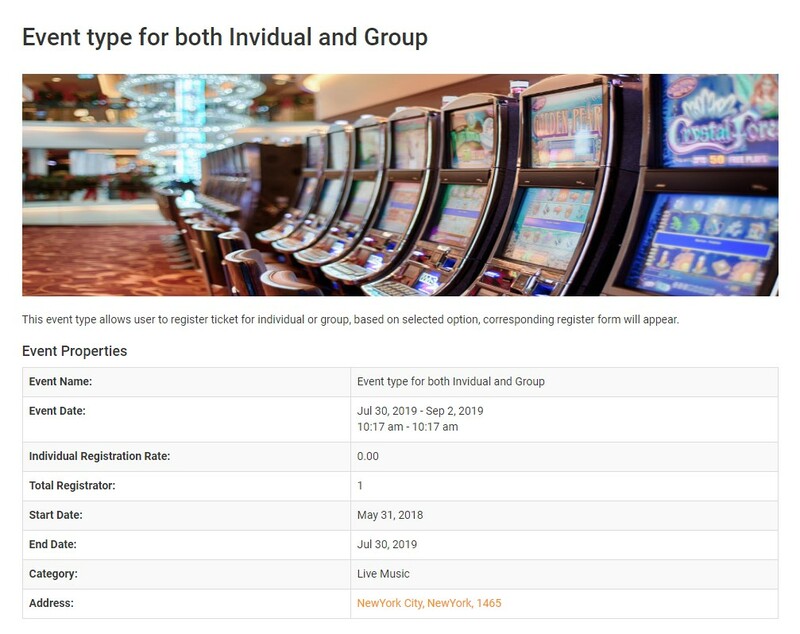 Assign Confirmation Number to Each Group Member: In a group registration, you can choose here if a unique confirmation number will be assigned to each member of a group, or if it will just be one number for the entire group. Prerequisite Paid Status: Select YES if you want to require that a user has Paid for the prerequisite event(s) in order to be allowed to register for the new event. Select NO if the Paid status does not matter. Prerequisite Attended Status: Select YES if you want to require that a user has Attended the prerequisite event(s) in order to be allowed to register for the new event. Select NO if the Attended status does not matter. Security Images On: You can add security images to your Free Registrations and your Waiting List forms. 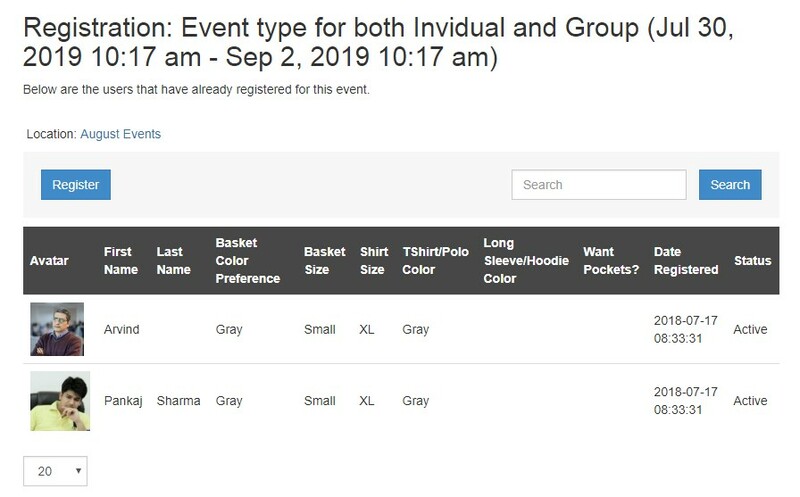 Show Group Size Warning: In Detailed Group Registrations, enabling this feature will add a warning box under the navigation buttons on group member pages, letting the user know how many spaces are available for the event. Apply Discount Code: Select if you want discount codes applied to each member or once for the entire group in a group registration. Apply Late Fee: Select if you want late fee amounts applied to each member or once for the entire group in a group registration. 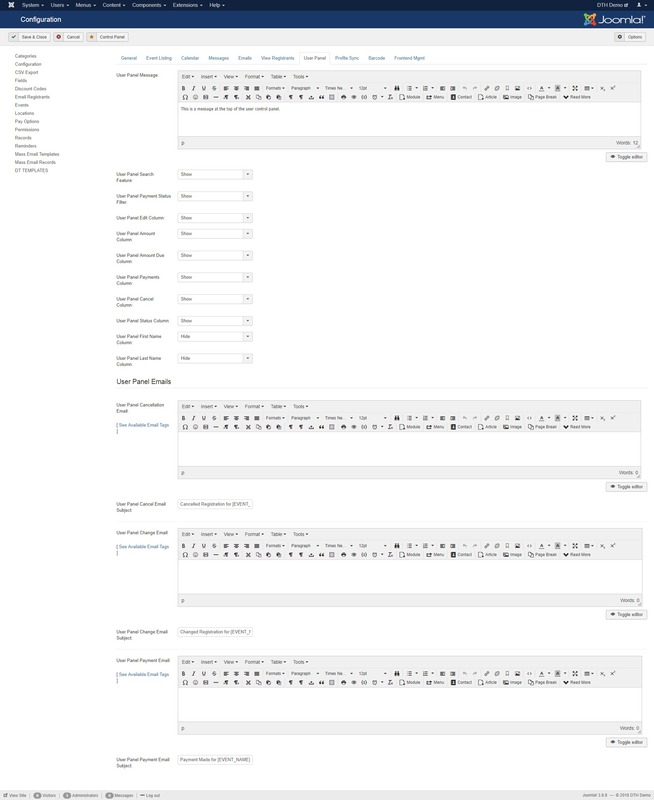 In This section allow you to configure the event listing page layout, to show hide the filter, events dates, title, location and misc information etc. Show Category Filter: Select whether or not you want the category filter to show above the list of events. 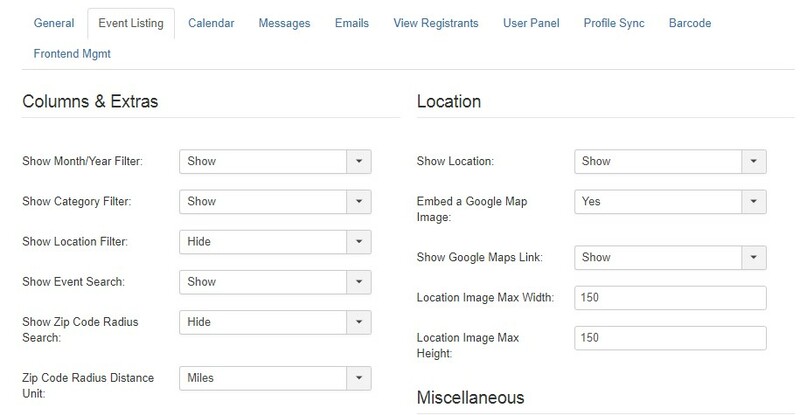 Show Location Filter: Select whether or not you want to show the location filter above the list of events, allowing the user to filter events shown to a specified location. Show Event Image: Select if you want to show the event thumbnail image or not. Show Event Date: Show or hide the date column on the event list. Event List Ordering: elect the desired ordering of events on your site. 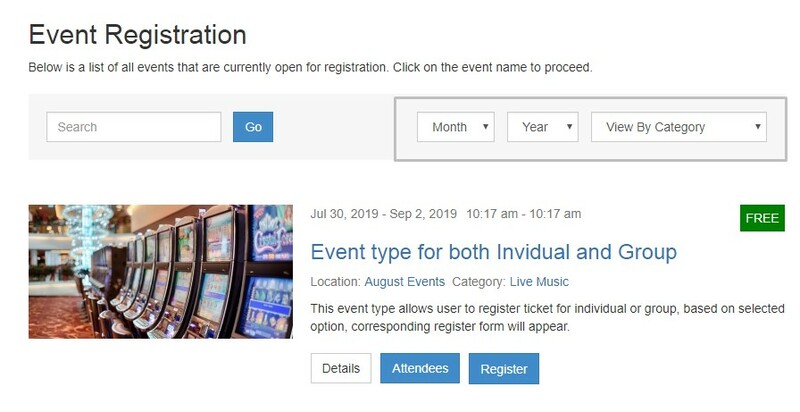 Event List Secondary Ordering: Events will be listed based on the primary ordering set above, but when the primary ordering is CATEGORY, then this secondary ordering will apply to establish the ordering of events within the category. This setting will not affect any other ordering option. Number of Events to List Per Page: Input how many events to list per page on the frontend listing of events. Event Thumbnail Width: Specify the forced width of the event thumbnails. Regardless of the image size, it will be displayed at this width. Show Moderator: Select if you want to show the event moderator on the list of events. It can be displayed as the moderator's full name, their username, or both. 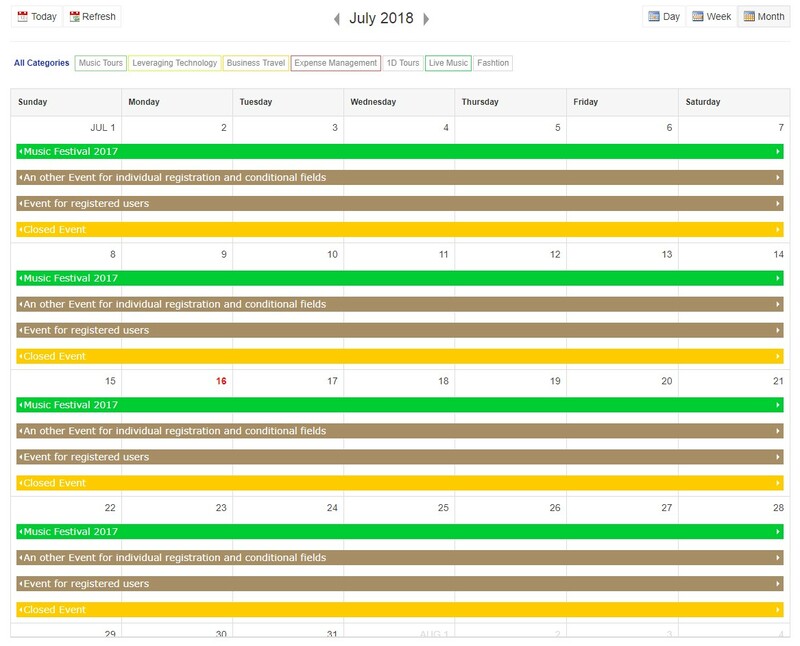 Show Category: Select if you want to show category buttons below the calendar. It will give a color-coded set of buttons for each category. Clicking them will show events in the calendar only for the selected category. Link the Moderator Name to Profile: Select if you want the moderator name to be a link to their user profile page. 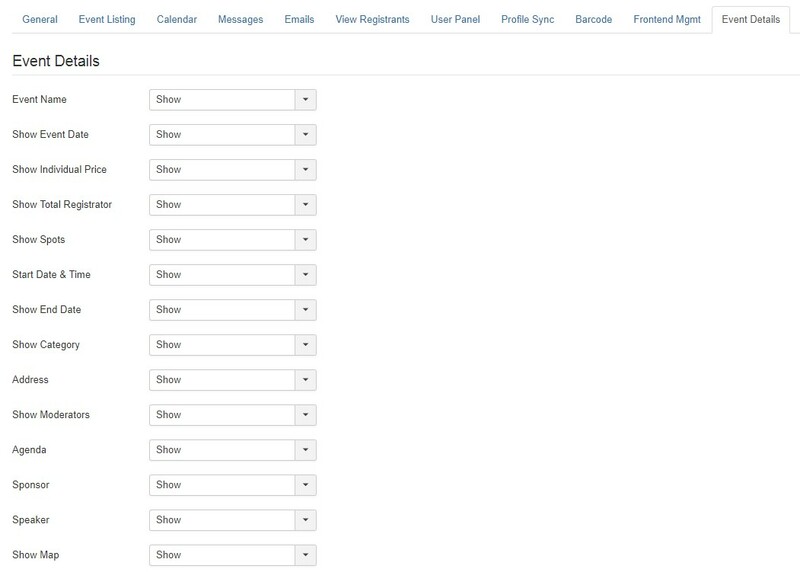 This section help you to configure the calender setup for events, You can control all the settings via this tab. Wrap Event Title: Select if you want the event title to wrap onto multiple lines as needed. If NO, then the title will get cut off if it is longer than the space available. 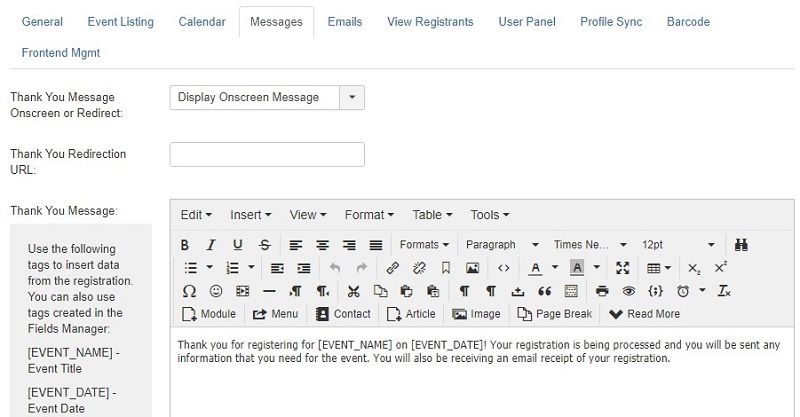 This section help you to configure the message for user that will come after the event registration.This section allow you to add custom message for users with redirect option. Cut-Off Date Message: This is the message to display to users when they attempt to register for an event that is past the cut off date for registration. Prerequisite Event Message: his is the message to be displayed on the screen when a user tries to register for an event without having first registered for all of the prerequisite events. You can use the tag [PREREQ_EVENTS] to dynamically include a list of any prerequisite events that apply. You can also use the tag [PREREQ_CATEGORY] to display a list of prerequisite categories for this event. Overlapping Event Message: This is the message to display onscreen when a user tries to register for an event that overlaps the date/time of an event they are already registered for. This will only display if the Overlapping Event Check is set to YES in the general configuration. This section helps you to configure the email messages that has been sent to user in form of Thanks email, waiting email, new user registration notification, and status change notifications. From Name: Enter the name that emails will show as FROM. If no name is provided, the name from the global Joomla mail config will be used. Send Admin Email FROM Registrant: Select YES if you want the Admin Notification Email to be sent as FROM the registrant's name and email address, or leave it set as NO so the email is sent from the default email settings from configuration. Frontend Event Notification Email: Enter the email address(es) to be notified when frontend users create, edit or delete events. Send Notification Email When Frontend User: Select any of the given options to enable the sending of an email notification to provided email address whenever a frontend user creates, edits or deletes an event. Thanks email subject: Email Subject to send after successful registration. Use [EVENT_NAME] to insert the event title. Paid Status Change Email Notice: This is the email that will be sent to registrants to notify them of any change to their payment status. For example, admin changes the record from "Not Paid" to "Paid". 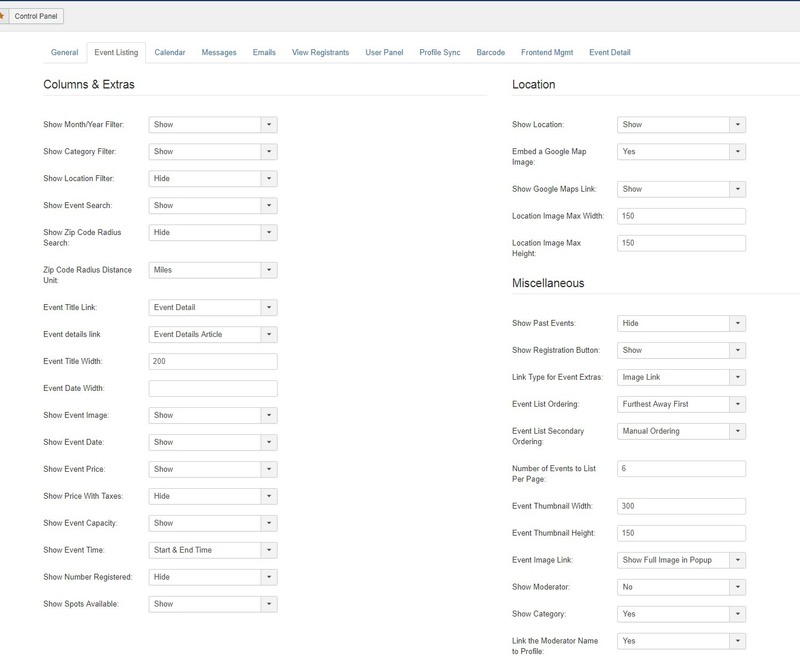 This section help you to configure Regsitrant page view, Allow you to setup the message, name, avatar and group settings. Message to show above the Registrant List: Enter a message to display above all registrant list pages. HTML is supported in this field. Registrant List Access: Select the access level for the list of registrants. If set to Public, all site users will be able to view this information. If set to Registered, only logged in users will have access to this list. Set it to Special to give only admin user level access. Link to Registrant's Profile: Select if you want to link the registrant record to their Community Builder or JomSocial profile. 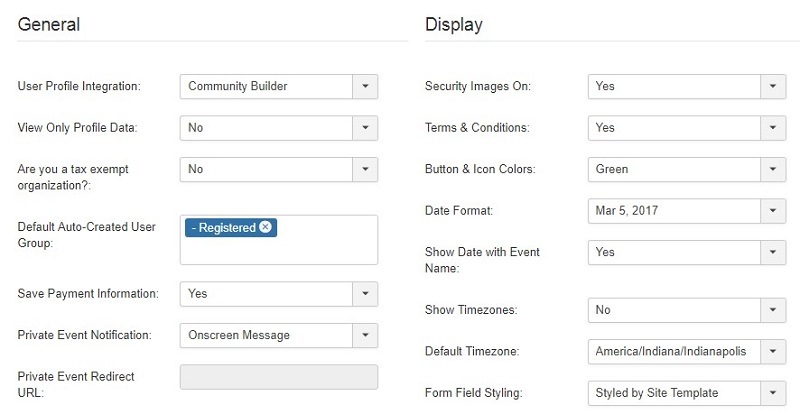 If you are using Community Builder or JomSocial integration, please use the following field mapping options to select which profile fields should connect to the form fields of DT Register. 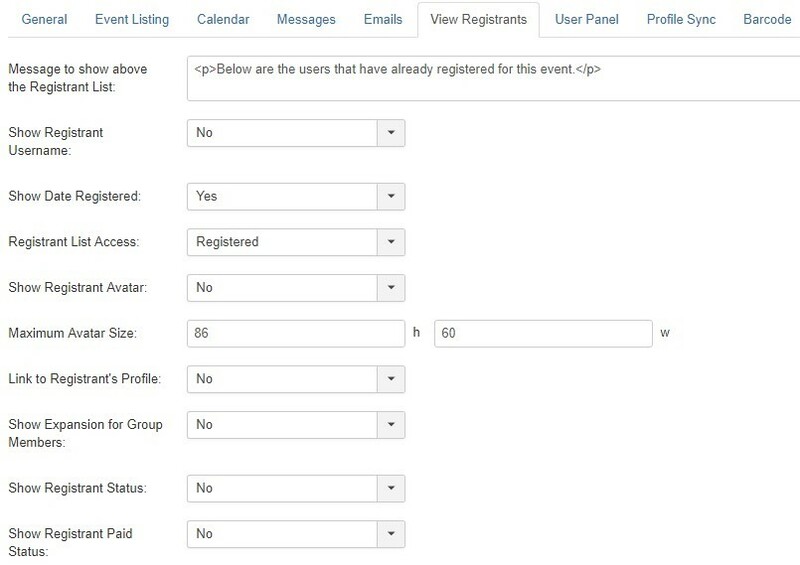 When you assign the fields, it will allow the event registration form fields to auto-populate with the selected data from a logged in user's profile. This section allow you to enable the barcode option with barcode display settings. The barcode will be sent to user after even regsiration. Barcode DPI: Set the DPI of your barcode image. Default is 72. Barcode Resolution: Select the resolution of the barcode image.This is like a zoom setting, with 1 being the smallest and 3 being the largest display. This section allow you to configure records ,events and discount code settings. Show email address: Select whether or not the frontend records management list will show email addresses. Show Registration Date: Select whether or not the frontend records management list will show registration dates. Show Payment Method: Select whether or not the frontend records management list will show payment methods. Show Payment Status: Select whether or not the frontend records management list will show payment status. Show Registration Status Select whether or not the frontend records management list will show registration status. Show Code Limit: Select whether or not the frontend discount code management list will show code limits. Show Code Usage #: Select whether or not the frontend discount code management list will show the number of time a discount code has been used. 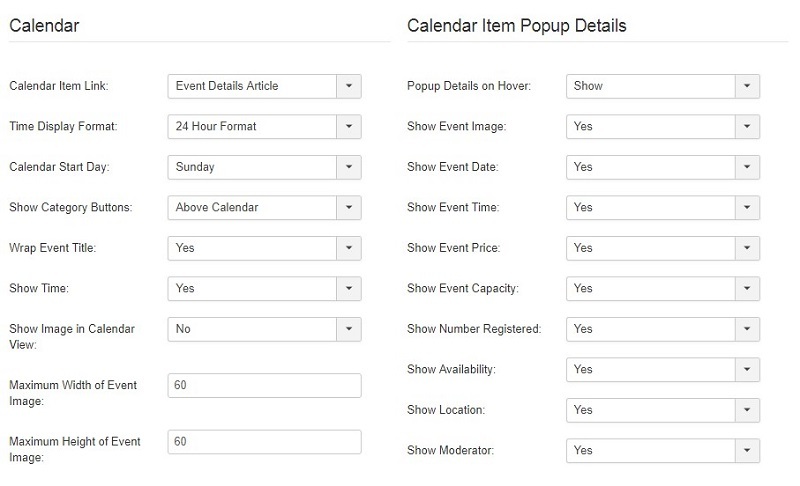 This section allow you to configure display settings for event details page. Default Logo: Enter the default logo that will be used on all invoices. 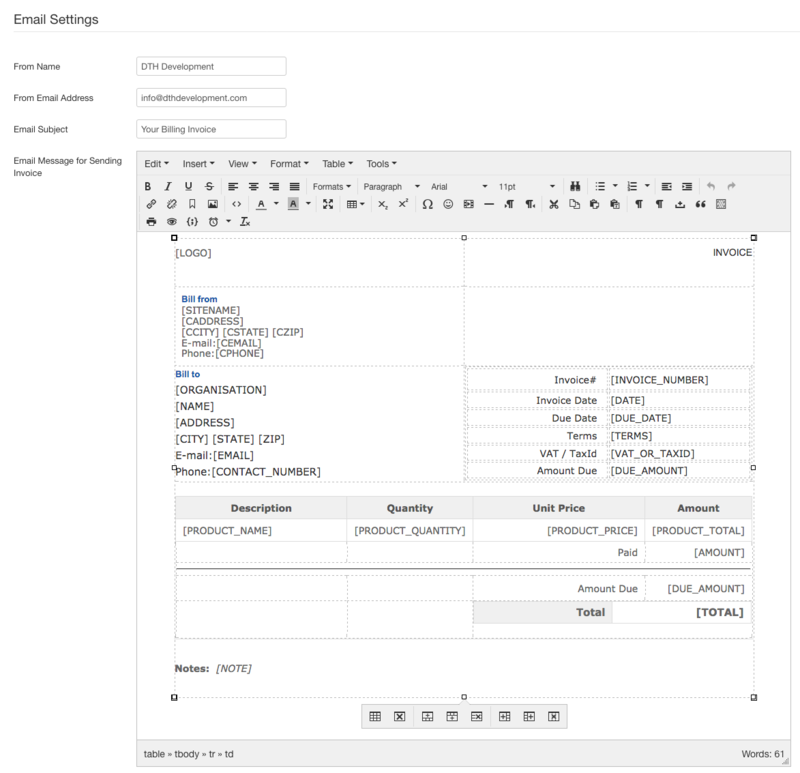 This can be overridden at the time of generating the invoice. From Email Address: nter the email address that recipient will see as FROM. If nothing is entered the email address from the Global Config in Joomla will be used.